I used to watch my mom get so frustrated every time she lost her glasses. And you'd be amazed how often that it happened too. At least five or ten times a day on average you'd find her wandering around muttering as she hunted for a pair of reading glasses. The funny thing was, she has about six pair, and yet she could never seem to find any of them! That's why I started making beaded eyeglass chains. These convenient strands of beads hook on to the arms of a pair of glasses and allow them to dangle both securely and decoratively around the neck like a necklace. 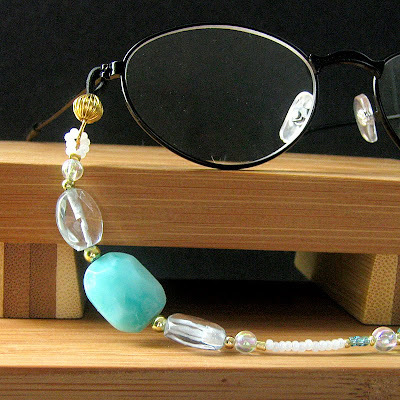 This beaded eyeglasses holder is made of vibrant beads in cool shades of aqua and turquoise are joined with a hint of golden accents for a cool breeze on a summer's day look. The 30.5-inch (77.5 cm) strand is made with smooth beads at the nape for the comfort of the wearer and decorative beads at the ends to show off a sense of style while keeping eyeglasses easily in reach.